“True and faithful.” For President Joseph Fielding Smith, this was more than an often-repeated phrase. It was a heartfelt expression of his hope for all people. It was also a description of his life, from his childhood through his service as President of The Church of Jesus Christ of Latter-day Saints. Joseph Fielding Smith “was born as a child of promise,” said Elder Bruce R. McConkie of the Quorum of the Twelve Apostles. Elder McConkie, a son-in-law to President Smith, explained that Julina Lambson Smith “had three daughters but no sons, and so she went before the Lord and, like Hannah of old, ‘vowed a vow.’ [1 Samuel 1:11.] Her promise: that if the Lord would give her a son, ‘she would do all in her power to help him be a credit to the Lord and to his father.’ The Lord hearkened to her prayers, and she kept her promise to him.”3 On July 19, 1876, Julina and her husband, Joseph F. Smith, welcomed a newborn son into their family. They named him Joseph Fielding Smith Jr., after his father. At birth, Joseph Fielding Smith joined a family rich in faith, service, and leadership. His grandfather Hyrum Smith was the Prophet Joseph Smith’s brother and a valiant witness of the Restoration of the gospel. The Lord appointed Hyrum to “be a prophet, and a seer, and a revelator unto [His] church,” saying that Hyrum’s name would “be had in honorable remembrance from generation to generation, forever and ever” (D&C 124:94, 96). With his brother Joseph, Hyrum sealed his testimony with his blood, martyred by a mob on June 27, 1844 (see D&C 135). Joseph Fielding Smith’s father, Joseph F. Smith, shouldered heavy responsibilities from the time he was a child. The firstborn child of Hyrum and Mary Fielding Smith, he was five years old when his father was martyred and nine years old when he helped his widowed mother drive her wagon from Nauvoo, Illinois, to the Salt Lake Valley. He later served as a missionary and as a member of the Quorum of the Twelve Apostles. He was a Counselor in the First Presidency when his son Joseph was born. From October 17, 1901, to November 19, 1918, he served as President of the Church. 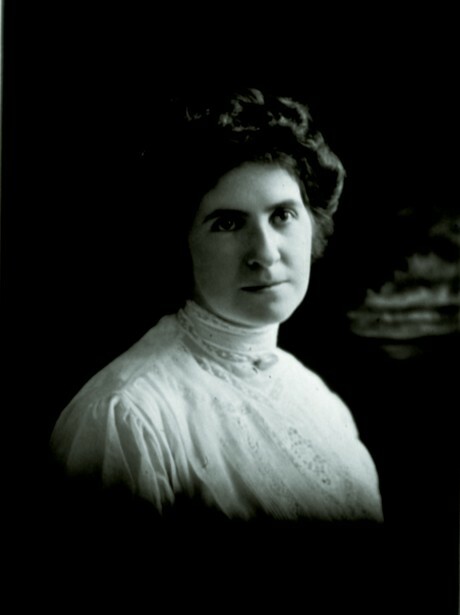 Joseph Fielding Smith’s mother, Julina Lambson Smith, was part of one of the early pioneer families in the Salt Lake Valley. From the age of nine, she was raised in the home of her uncle George A. Smith, who was a member of the Quorum of the Twelve Apostles at the time, and her aunt Bathsheba W. Smith. (Elder Smith later served as First Counselor in the First Presidency under President Brigham Young, and Sister Smith later served as Relief Society general president.) As an adult, Julina was a devoted wife and mother and a dedicated member of Relief Society. She was known for her compassion and skill as a midwife, bringing “nearly 1,000 babies into the world” and caring for their mothers.4 From October 1910 to April 1921, she served as second counselor in the Relief Society general presidency. Joseph learned how to work at an early age. His family owned a farm in Taylorsville, Utah, about 10 miles (16 kilometers) from their home, where he and his brothers helped with irrigating, harvesting hay, and taking care of livestock. At home, the family cared for a large vegetable garden, several fruit trees, three long rows of grapes, a flock of chickens, three cows, and a few horses. President Joseph F. Smith practiced plural marriage, so the family had many mouths to feed and many hands to help with the work. Because Joseph Fielding Smith was one of the oldest sons in the large family, he was given some responsibilities that normally would have been given to an adult. In addition to these responsibilities, he always kept up with his studies for school. To balance his heavy work responsibilities, Joseph found some time to play. He and his siblings liked to play nighttime games around the house, hiding among the grapevines—“especially when the grapes were ripe.”6 He also loved to play baseball. Each ward had an organized baseball team, and he enjoyed these friendly rivalries. Although baseball was important to young Joseph Fielding Smith, he sometimes left games early, pulled away by an interest that was even more important to him. 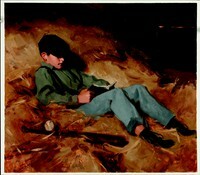 At such times, he could be found secluded “in the hayloft or in the shade of a tree to get back to his reading” of the Book of Mormon.7 “From my earliest recollection,” he later said, “from the time I first could read, I have received more pleasure and greater satisfaction out of the study of the scriptures, and reading of the Lord Jesus Christ, and of the Prophet Joseph Smith, and the work that has been accomplished for the salvation of men, than from anything else in all the world.”8 He began to establish a pattern of personal gospel study when he received his first copy of the Book of Mormon at age eight. He eagerly read the standard works and Church publications. He carried a pocket-sized edition of the New Testament so he could read during lunch breaks and as he walked to and from his job at ZCMI. Steadily and persistently, he added to the strength of his testimony of the restored gospel. Young Joseph Fielding Smith sometimes left baseball games early so he could read the Book of Mormon in his family’s hayloft. On April 6, 1893, Joseph attended the first dedicatory session of the Salt Lake Temple. President Wilford Woodruff, the fourth President of the Church, presided at the session and offered the dedicatory prayer. Seated on the stand to the left of President Woodruff was his Second Counselor, President Joseph F. Smith. As young Joseph Fielding Smith helped support his family, studied the gospel, and prepared for priesthood blessings, his efforts did not go unnoticed by a young woman named Louie Shurtliff. Louie, whose parents lived in Ogden, Utah, came to live with the Smith family so she could attend the University of Utah, which at the time was located across the street from the Smiths’ home. Eventually, Louie and Joseph discussed marriage. However, a question remained in their minds: would Joseph be called to serve a mission? In those days, young men and women desiring to serve missions did not approach their bishops to be recommended for such calls. The processing of mission calls was done entirely through the office of the President of the Church. A young man never knew when he might find a mission call in the mailbox. Louie graduated from the university in the spring of 1897 and moved back to Ogden with her parents. One year later, with apparently no mission call forthcoming, the couple decided to move forward with marriage plans. As Joseph later said, “I persuaded her to change her place of residence, and on the 26th day of April, 1898, we went to the Salt Lake Temple and were married for time and all eternity by my father, President Joseph F. Smith.”13 As Joseph and Louie began their life together, they lived in a small apartment in the Smith family’s home. “This certifies that the bearer Elder Joseph F. Smith Jr. is in full faith and fellowship with The Church of Jesus Christ of Latter-day Saints and by the General Authorities of said Church has been duly appointed a Mission to Great Britain to Preach the Gospel and administer in all the Ordinances thereof pertaining to his office. “And we invite all men to give heed to his Teachings and Counsels as a man of God, sent to open to them the door of Life and Salvation—and to assist him in his travels, in whatsoever things he may need. “And we pray God, The Eternal Father, to bless Elder Smith and all who receive him and minister to his comfort, with the blessings of Heaven and Earth, for time and all eternity, in the name of Jesus Christ, Amen. From the time his train—uncomfortable and filled with tobacco smoke—sped away from home, Elder Smith dedicated himself to his mission. His journal entries and the letters he sent and received revealed the difficulties he faced as a missionary and the faith and devotion with which he faced them. Louie sent letters at least once a week. “Remember,” she once wrote, “I am here to love and pray for you and that I never forget you for one single moment. … Bless you, my own precious husband, is my prayer always.”25 Louie was clear about her devotion to her husband, and she was equally clear about her devotion to the Lord and His work. She consistently reminded Joseph not to allow homesickness to weaken his resolve to serve. Elder Joseph Fielding Smith was honorably released from his mission on June 20, 1901. In his two years of diligent service, “he did not make one convert, did not have opportunity to perform one baptism, although he did confirm one convert.”28 However, he and his companions had planted gospel seeds, helping many people find greater peace and understanding, and he had grown personally as a student and teacher of the gospel and as a priesthood leader. Joseph arrived in Salt Lake City on July 9, 1901. After spending a few days with Louie’s family in Ogden, Joseph and Louie returned to their home with the Smiths and resumed their life together. Their marriage was characterized by faith, diligence, and service, as they worked to establish a home and family and to serve in the Church. Soon after Joseph returned home, he began looking for a job so he could support his family. With help from a family member, he secured a temporary job at the Salt Lake County clerk’s office. About five weeks later, he accepted a position in the Church Historian’s office. As he learned more about the history of the Church, he also became more aware of people who sought to discredit the Church and its leaders. He worked tirelessly to provide information in defense of the faith. This was the beginning of service that would bless the Church for years to come. In the spring of 1902, Louie was pregnant. She and Joseph were grateful for their little apartment, but they looked forward to building their own home. Joseph’s secure employment allowed them to start making plans. They hired a building firm and made arrangements for Joseph to do much of the work himself, thus cutting expenses. Their first child, a daughter named Josephine, was born in September 1902, and they moved into their new home about 10 months later. In 1906, after Louie suffered through a difficult pregnancy, they welcomed another daughter into their home and named her Julina. Joseph set many of his Church responsibilities aside in March 1908, feeling a need to stay home with Louie as much as possible. She was suffering from a severe, unremitting illness related to the early stages of her third pregnancy. Despite prayers, priesthood blessings, solicitous care from her husband, and careful attention from doctors, she continued to worsen. She died on March 30. Joseph was soon overwhelmed with the task of raising two little girls in a motherless home. His parents invited the young family to live with them. Even with this help, the widower realized that his little children needed the care of a loving mother. As he did with all important decisions, Joseph made this issue a matter of fervent prayer. Ethel Georgina Reynolds, a clerk in the Church Historian’s office, became the answer to his prayers. Joseph invited her to join him and his daughters on an outing in the park on July 6, 1908. The outing was successful, as all four of them enjoyed each other’s company. Ten days later, Joseph and Ethel enjoyed a date together without the children, and soon thereafter they were engaged to be married. Ethel and Joseph were sealed in the Salt Lake Temple on November 2, 1908. Years later in a letter to Ethel, Joseph wrote, “You do not know how often I have thanked the Lord that I made no mistake when I needed a companion. You were sent to me.”34 In addition to being a loving companion to Joseph, Ethel quickly became a second mother to Josephine and Julina. Just before general conference in April 1910, President John R. Winder, First Counselor in the First Presidency, died. Elder John Henry Smith, who had been serving in the Quorum of the Twelve, was called to serve in the First Presidency, leaving a vacancy in the Quorum of the Twelve. The First Presidency and the Quorum of the Twelve met in the Salt Lake Temple to discuss men who would be qualified to fill that vacancy. After counseling together for about an hour, they were unable to “reach any unanimity of feeling on the matter. Finally President Joseph F. Smith retired to a room by himself and knelt in prayer for guidance. When he returned he somewhat hesitatingly asked the 13 other brethren whether they would be willing to consider his son Joseph Fielding Smith Jr. for the position. He was reluctant to suggest it, he said, because his son Hyrum was already a member of the council and his son David was a Counselor in the Presiding Bishopric. Church members, he feared, would be disgruntled to have another of his sons appointed as a general authority. Nevertheless he felt inspired to offer Joseph’s name for consideration. The other men seemed immediately receptive to the suggestion and sustained President Smith in it. During his 60 years as a member of the Quorum of the Twelve Apostles, Joseph Fielding Smith saw many changes in the world. For example, when he was called to the apostleship, many people still used the horse and carriage as their primary means of transportation. At the end of his service in the quorum, he often traveled to assignments by jet plane. 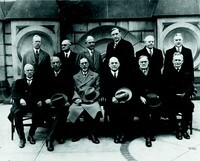 The Quorum of the Twelve Apostles in 1921. Elder Joseph Fielding Smith is standing on the far left. Elder Smith held many positions of trust and responsibility while serving as a member of the Quorum of the Twelve. For the first eight years of his ministry as an Apostle, he served unofficially as a secretary for his father. He served in this capacity until his father passed away in November 1918. In this role, Joseph Fielding Smith acted as scribe when his father dictated the vision of the redemption of the dead, now found in Doctrine and Covenants 138. Elder Smith served as Assistant Church Historian, as Church Historian for almost 50 years, as a counselor in the Salt Lake Temple presidency, as president of the Salt Lake Temple, as president of the Utah Genealogical and Historical Society, as the first editor and business manager of the Utah Genealogical and Historical Magazine, and as the chairman of the Executive Committee of the Church Board of Education. He also served as the chairman of the Church Publications Committee, an assignment that required him to read thousands of pages of manuscripts before they were prepared as lesson manuals and other Church publications. He was set apart as Acting President of the Quorum of the Twelve on October 6, 1950, and he served in that capacity until April 1951, when he was set apart as President of the Quorum of the Twelve. He served in that capacity from April 1951 to January 1970, when he became President of the Church. From 1965 to 1970, he also served as a Counselor in the First Presidency while continuing in his responsibilities as President of the Quorum of the Twelve. This no-nonsense, straightforward approach to teaching was tempered by gentleness and kindness. Elder Boyd K. Packer once witnessed this in a meeting when Joseph Fielding Smith was chairman of the Church’s Missionary Committee. “A report was presented concerning an accident involving two missionary elders in a Church-owned automobile. An elderly vegetable vendor had run a stop sign with his truck. The missionary car was struck broadside and totally wrecked. The driver of the truck was cited by the police. He had no insurance. Fortunately, neither missionary was seriously injured. “President Smith sat silent as the members of the committee considered the matter. After some discussion they instructed the managing director of the Missionary Department to retain an attorney and press the matter in court. When Elder Smith was called to the apostleship, he had three children: Josephine and Julina and Ethel’s firstborn child, Emily. Seven months later, the family welcomed another daughter. Ethel and Joseph named her Naomi. Because of complications at birth, Naomi had to struggle for her life, and the family feared that she might not live long. But, as her father later said, she “was saved through the power [of] prayer and administration after it appeared that breath could not enter her body.”39 Ethel later gave birth to seven other children: Lois, Amelia, Joseph, Lewis, Reynolds, Douglas, and Milton. Beginning in 1933, the happiness in the Smith home was sometimes interrupted by a heavy “burden of care,” as Elder Smith had expressed in his poem nine years earlier. Ethel began to suffer from “a terrible illness which she could not understand. At times she was plunged into the depths of depression and at other times her mind raced beyond control forcing her exhausted body to do more and more. The tender love and support of her family, prayers, and blessings, even hospitalizations did not seem to help.”47 After four years of suffering, she died on August 26, 1937. Writing of her death, her bereaved husband recorded, “A better woman could not be found, or truer wife and mother.”48 In the depths of his sorrow, he felt the comforting knowledge that he and Ethel Reynolds Smith were bound together for the eternities by a sacred sealing covenant. When Ethel died, five children still lived in the Smith home. Two of them would soon move away—Amelia was engaged to be married, and Lewis was preparing to serve a full-time mission. This would leave 16-year-old Reynolds, 13-year-old Douglas, and 10-year-old Milton. Concerned about these motherless sons, Joseph Fielding Smith pondered the idea of marrying again. With this idea in mind, Elder Smith soon focused his attention on Jessie Ella Evans, a famous soloist with the Mormon Tabernacle Choir. Jessie had sung a solo at Ethel’s funeral services, and Elder Smith had sent her a note to express his appreciation. That note had led to conversations by telephone. Elder Smith and Jessie had not known one another before this exchange, but they quickly became good friends. Elder Smith spent days thinking and praying about the possibility of asking Jessie to marry him. Finally he wrote her a letter in which he hinted that he would like to have a more personal friendship with her. Four days later, he worked up the courage to deliver the letter in person. He took it to the city and county offices, where she worked as the county recorder. Later he recorded the following in his journal: “Went to County Recorder’s office. … Had interview with recorder, very important, and left her the letter I wrote.”49 Following a week in which he traveled by train to stake conference meetings, Elder Smith returned home and once again visited with Jessie. Elder Francis M. Gibbons, who served as a secretary to the First Presidency when President Smith was President of the Church, described the relationship between Joseph Fielding Smith and Jessie Evans Smith: “Despite a difference of twenty-six years in their ages and differences in temperament, background, and training, Joseph Fielding and Jessie Evans Smith were remarkably compatible. She was an irrepressible extrovert, full of fun and good humor, who enjoyed the limelight of public attention. Joseph, on the other hand, was a quiet, retiring introvert, dignified and detached, who always seemed somewhat uncomfortable in a public setting and who never sought to call attention to himself. The thing that bridged the wide gulf between these two disparate personalities was the genuine love and respect they had for each other.”51 This love and respect extended to Jessie’s mother, Jeanette Buchanan Evans, with whom Jessie had been living until the marriage. Sister Evans joined her daughter to live in the Smith home and helped care for the children. The new Sister Smith, addressed as Aunt Jessie by Elder Smith’s children and grandchildren, frequently joined her husband as he traveled to stake conferences. 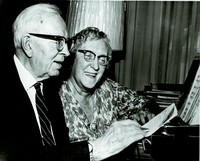 Local leaders often invited her to sing in meetings, and occasionally she persuaded her husband to sing a duet with her. In 1939, President Heber J. Grant assigned Elder and Sister Smith to tour all of the Church’s missions in Europe. As the war began, Elder Smith organized the evacuation of the 697 American missionaries serving in Europe. Because some of the missionaries had served as district and branch leaders, Elder Smith transferred those leadership responsibilities to local members. After fulfilling these duties, Elder Smith sailed for the United States with Jessie. They took a train from New York and arrived home seven months after they had left. As a member of the Quorum of the Twelve, Joseph Fielding Smith often stood before Latter-day Saints to testify of Jesus Christ, teach the restored gospel, and call the people to repentance. He delivered more than 125 sermons in general conference, participated in thousands of stake conferences, and spoke at events such as genealogy conferences and radio broadcasts. He also taught by the written word. For many years he wrote a feature in the Church’s Improvement Era magazine, answering questions submitted by readers. He also wrote other articles for Church magazines and the Church section of the Deseret News. During his service as an Apostle, from 1910 to 1972, his writings were published in 25 books, including Essentials in Church History, Doctrines of Salvation, Church History and Modern Revelation, and Answers to Gospel Questions. “1. His love of the Lord and the absolute, unswerving fidelity with which he sought to signify that love by keeping his commandments and doing ever those things which would please the Lord. “2. His loyalty to the Prophet Joseph Smith and the everlasting truths restored through him; to his grandfather, the Patriarch Hyrum Smith, … [who] met a martyr’s death; and to his father, President Joseph F. Smith, whose name is enshrined forever in the celestial city as one who endured valiantly in the cause of him whose blood was shed that we might live. “We who labor in the Council of the Twelve under his leadership have occasion to glimpse the true nobility in his character. Daily we see continuing evidences of his understanding and thoughtful consideration of his fellow workers in making our assignments and in co-ordinating our efforts to the end that the work of the Lord might move forward. We only wish that the entire Church could feel the tenderness of his soul and his great concern over the welfare of the unfortunate and those in distress. He loves all the saints and never ceases to pray for the sinner. On a Sabbath morning, January 18, 1970, President David O. McKay’s mortal life came to an end. The responsibility of Church leadership now rested on the Quorum of the Twelve Apostles, with 93-year-old Joseph Fielding Smith as their President. On January 23, 1970, the Quorum of the Twelve met and officially sustained President Smith in his calling as President of The Church of Jesus Christ of Latter-day Saints. 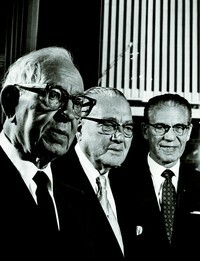 President Smith selected Harold B. Lee as First Counselor and N. Eldon Tanner as Second Counselor. Then all three men were set apart to fulfill their new responsibilities. “I left the office one Friday afternoon thinking of the weekend conference assignment. I waited for the elevator to come down from the fifth floor. “As the elevator doors quietly opened, there stood President Joseph Fielding Smith. There was a moment of surprise in seeing him, since his office is on a lower floor. Under President Smith’s leadership, the Church continued to grow. For example, 81 stakes were created, including the first stakes in Asia and Africa, and Church membership passed 3 million. Two temples were dedicated—in Ogden, Utah, and Provo, Utah. Even as the Church grew worldwide, President Smith emphasized the importance of individual homes and families. He reminded Latter-day Saints that “the Church organization really exists to assist the family and its members in reaching exaltation.”63 He taught: “The family is the most important organization in time or in eternity. … It is the will of the Lord to strengthen and preserve the family unit.”64 In an effort to strengthen families and individuals, the Church placed greater emphasis on family home evening, a program that had been encouraged since 1909, when President Smith’s father was President of the Church. Under the leadership of President Joseph Fielding Smith, Mondays were officially designated for family home evening. On those nights, no Church meetings were to be held, and local Church facilities were closed. Despite his advanced age, President Smith approached his calling with childlike humility and youthful energy. In the two years and five months he served as the Church’s prophet, seer, and revelator, Latter-day Saints across the world were inspired by his messages. On August 3, 1971, Jessie Evans Smith passed away, leaving President Joseph Fielding Smith as a widower for the third time. As a result, President Smith went to live with his daughter Amelia McConkie and her husband, Bruce. His other children regularly took turns visiting him and taking him for rides. He continued to go to his office each weekday, attend meetings, and travel on Church business. On June 30, 1972, President Smith left his office on the first floor of the Church Administration Building toward the end of the day. With his secretary, D. Arthur Haycock, he went to the Church Historian’s office, where he had labored prior to becoming President of the Church. He desired to greet all those who served there. After shaking their hands, he went to the basement of the building to shake the hands of the telephone operators and others who worked in that area to show his appreciation. This was his last day at the office. Gordon B. Hinckley, “Believe His Prophets,” Ensign, May 1992, 52. Thomas S. Monson, in “News of the Church,” Ensign, May 1996, 110. Bruce R. McConkie, “Joseph Fielding Smith: Apostle, Prophet, Father in Israel,” Ensign, Aug. 1972, 29. Julina Lambson Smith, in Joseph Fielding Smith Jr. and John J. Stewart, The Life of Joseph Fielding Smith (1972), 52. Joseph Fielding Smith, in The Life of Joseph Fielding Smith, 65. Joseph Fielding Smith Jr. and John J. Stewart, The Life of Joseph Fielding Smith, 51. Joseph Fielding Smith Jr. and John J. Stewart, The Life of Joseph Fielding Smith, 57. In Conference Report, Apr. 1930, 91. Joseph Fielding Smith Jr. and John J. Stewart, The Life of Joseph Fielding Smith, 62. Joseph Fielding Smith Jr. and John J. Stewart, The Life of Joseph Fielding Smith, 71–72. Joseph Fielding Smith, in Conference Report, Oct. 1970, 92. See Joseph Fielding Smith Jr. and John J. Stewart, The Life of Joseph Fielding Smith, 73–74; Francis M. Gibbons, Joseph Fielding Smith: Gospel Scholar, Prophet of God (1992), 52–53. Joseph Fielding Smith, in The Life of Joseph Fielding Smith, 75. Joseph Fielding Smith, in The Life of Joseph Fielding Smith, 79. See The Life of Joseph Fielding Smith, 80. In The Life of Joseph Fielding Smith, 81. See The Life of Joseph Fielding Smith, 82. Joseph Fielding Smith Jr. and John J. Stewart, The Life of Joseph Fielding Smith, 83. Joseph Fielding Smith, in The Life of Joseph Fielding Smith, 90. Joseph Fielding Smith, in The Life of Joseph Fielding Smith, 117; see also page 116. Joseph F. Smith, in The Life of Joseph Fielding Smith, 116. Lewis Shurtliff, in The Life of Joseph Fielding Smith, 112–13. Joseph Fielding Smith Jr. and John J. Stewart, The Life of Joseph Fielding Smith, 113. Joseph Fielding Smith, in The Life of Joseph Fielding Smith, 96. Louie Smith, in The Life of Joseph Fielding Smith, 113–14. Joseph Fielding Smith Jr. and John J. Stewart, The Life of Joseph Fielding Smith, 92. Joseph Fielding Smith, in The Life of Joseph Fielding Smith, 115. See The Life of Joseph Fielding Smith, 91. In Francis M. Gibbons, Joseph Fielding Smith: Gospel Scholar, Prophet of God, 124. See Joseph Fielding Smith, in The Life of Joseph Fielding Smith, 152–53. See Joseph Fielding Smith: Gospel Scholar, Prophet of God, 113. Joseph Fielding Smith, in The Life of Joseph Fielding Smith, 160. Joseph Fielding Smith, in The Life of Joseph Fielding Smith, 162. Joseph Fielding Smith, in The Life of Joseph Fielding Smith, 169. Joseph Fielding Smith Jr. and John J. Stewart, The Life of Joseph Fielding Smith, 174–76. In Conference Report, Oct. 1910, 39. In Conference Report, Oct. 1919, 88–89. Lucile C. Tate, Boyd K. Packer: A Watchman on the Tower (1995), 176. Joseph Fielding Smith, in Joseph Fielding Smith: Gospel Scholar, Prophet of God, 162. Ethel Smith, in Bryant S. Hinckley, “Joseph Fielding Smith,” Improvement Era, June 1932, 459. See The Life of Joseph Fielding Smith, 14. See The Life of Joseph Fielding Smith, 234. See The Life of Joseph Fielding Smith, 15. See The Life of Joseph Fielding Smith, 237. 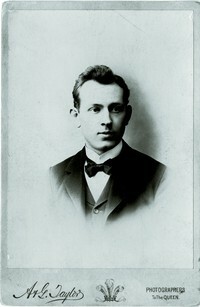 Joseph Fielding Smith, in The Life of Joseph Fielding Smith, 188–89. Joseph Fielding Smith Jr. and John J. Stewart, The Life of Joseph Fielding Smith, 242–43. Joseph Fielding Smith, in The Life of Joseph Fielding Smith, 249. Joseph Fielding Smith, in Joseph Fielding Smith: Gospel Scholar, Prophet of God, 275. See The Life of Joseph Fielding Smith, 251–58. Francis M. Gibbons, Joseph Fielding Smith: Gospel Scholar, Prophet of God, 278–79. Martha Toronto Anderson, A Cherry Tree Behind the Iron Curtain (1977), 32. Sheri L. Dew, Ezra Taft Benson: A Biography (1987), 204. Joseph Fielding Smith, in The Life of Joseph Fielding Smith, 282–83. See Joseph Fielding Smith: Gospel Scholar, Prophet of God, 315. Joseph Fielding Smith, in Joseph Fielding Smith: Gospel Scholar, Prophet of God, 332. Joseph Fielding Smith, in The Life of Joseph Fielding Smith, 287–88. Bruce R. McConkie, “Joseph Fielding Smith: Apostle, Prophet, Father in Israel,” Ensign, Aug. 1972, 28. Quorum of the Twelve Apostles, “President Joseph Fielding Smith,” Improvement Era, July 1956, 495. Ezra Taft Benson, in Sheri L. Dew, Ezra Taft Benson, 411. Boyd K. Packer, “The Spirit Beareth Record,” Ensign, June 1971, 87. Joseph Fielding Smith, in “Message from the First Presidency,” Ensign, Jan. 1971, inside front cover and page 1. Joseph Fielding Smith, “Counsel to the Saints and to the World,” Ensign, July 1972, 27. Joseph Fielding Smith, Sealing Power and Salvation, Brigham Young University Speeches of the Year (Jan. 12, 1971), 2. Joseph Fielding Smith, “The Plan of Salvation,” Ensign, Nov. 1971, 5. Joseph Fielding Smith, “To Know for Ourselves,” Improvement Era, Mar. 1970, 3. Joseph Fielding Smith, “The First Prophet of the Last Dispensation,” Ensign, Aug. 1971, 7. Joseph Fielding Smith, “Our Responsibilities as Priesthood Holders,” Ensign, June 1971, 49. Joseph Fielding Smith, “My Dear Young Fellow Workers,” New Era, Jan. 1971, 4. Joseph Fielding Smith, “I Know That My Redeemer Liveth,” Ensign, Dec. 1971, 27. Joseph Fielding Smith, “President Joseph Fielding Smith Speaks on the New MIA Theme,” New Era, Sept. 1971, 40. Joseph Fielding Smith, in “Ogden Temple Dedicatory Prayer,” Ensign, Mar. 1972, 6. Joseph Fielding Smith, “Counsel to the Saints and to the World,” 27. Harold B. Lee, “The President—Prophet, Seer, and Revelator,” Ensign, Aug. 1972, 35. Bruce R. McConkie, “Joseph Fielding Smith: Apostle, Prophet, Father in Israel,” 24. Francis M. Gibbons, Joseph Fielding Smith: Gospel Scholar, Prophet of God, 495. N. Eldon Tanner, “A Man without Guile,” Ensign, Aug. 1972, 32. Harold B. Lee, “The President—Prophet, Seer, and Revelator,” 39. Salt Lake Tribune, July 4, 1972, 12. Bruce R. McConkie, “Joseph Fielding Smith: Apostle, Prophet, Father in Israel,” 24, 27.